The Borno Government says it will build a comprehensive orphanage for at least 8,000 children that have been separated from their parents by the Boko Haram crisis. The state’s Commissioner for Women Affairs, Hajiya Fanta Baba-Shehu, made this known in an interview with the News Agency of Nigeria (NAN) in New York. Baba-Shehu said the state government would deploy social workers both within and outside the country to cater for the abandoned children. “We have about 7,000 to 8,000 unaccompanied children and Borno State Government is trying to build an orphanage home – a big one, a huge one – in Borno State. “The Ministry of Women Affairs will coordinate the affairs of the orphanage home. “All our social workers, within and outside the country will help. “Within the provision of the 2017 budget, by God’s grace, the structure will be completed and all the special needs of the unaccompanied children and girls will be taken into consideration. “We have to get a dormitory for them, we have to get social workers, which we have in the Ministry – specialized people – who can help them. “Those that trauma has affected are going to be taken care of. Baba-Shehu said she participated at the recently-concluded UN Commission on Status of Women, where she met with donor agencies and partners working to promote humanitarian aid and respond to the huge humanitarian crisis in the state. 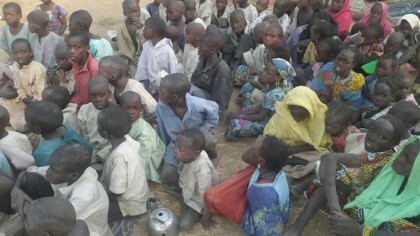 “We have more than 160,000 Internally Displaced Persons (IDPs) in Borno that are in the camps. “Those in the host community are more than the ones in the camps; they are more than two million. “Their situation is calm now and the Governor of Borno State, Alhaji Kashim Shettima, is now trying to ensure that they return home. “We expect most of the IDPs to be going home by May because we have a special ministry of RRR – that is Reconstruction, Rehabilitation and Resettlement of the victims. “We are taking them back and we have taken the women and children into consideration. “In Kaga Local Government Area there are special programmes for women empowerment. She said the leader of the All Progressives Congress, Tinubu visited the area where he inaugurated 432 resettlement houses for Boko Haram victims, 13 primary and junior secondary schools, a general hospital, five primary healthcare centres, irrigation items, mobile fish ponds and livestock for returning female IDPs. She stated that former first lady, Maryam Abacha, is expected to inaugurate a 250-bed ultra-modern hospital dedicated for women and children.